The Boston bombings may prove federal authority’s incompetence better than any other terrorism case. The Tsamaev brothers were no dummies, but there were many red flags that should have resulted in their capture and or imprisonment far before carrying out this horrific terrorist act. First, the Department of Homeland Security admits that the Russian government warned them that the elder Tsamaev brother was associated with radical Islamic groups in the Chechnya region of Russia back in 2011. Homeland security claims to have investigated the claim and found no evidence and dropped the case after a request to the Russia government for more information failed. This report conflicts with Russian accounts which claim to have warned the U.S. about Tsamaev multiple times over the past two years. Tsamaev spent over 6 months in the Chechnya region in 2011 before returning back to the United States. And let’s not forget, the Chechnya region has the highest rate of terrorism (mostly radical Islam) activity in Russia. Secondly, the older Tsamaev brother’s best friend and Mixed Martial Arts sparring partner was murdered (along with two others) on the tenth anniversary of 9-11. However, local authorities never questioned Tsamaev about the brutal murders where the victim’s throats were slashed ear to ear. It is hard to believe a Muslim friend of a victim murdered in that fashion on the anniversary of 9-11 is never questioned despite reports stating Tsamaev may have been the last to see his friend alive. Thirdly, if all of this is not bad enough, the FBI posts pictures of the Tsamaev brothers two days after bombings hoping to get citizen tips to identify and capture them. One would think the federal government would have a picture of the elder Tsamaev brother on file after being notified by the Russian government about his link to radical Islam and the fact they supposedly did a background check on him. Even if authorities cleared his name, one would think there would still be a record of him and facial recognition software would have identified him days before the manhunt concluded (which resulted in the death of a MIT police officer). Fourthly, the administration granted the Tsamaev brothers citizenship on 9-11 2009. Surely, Homeland Security must conduct background checks on individuals they are granting citizenship to, right? The point is that this administration, along with federal and local authorities, had several opportunities to identify Tsamaev as a threat, but failed. Yet, the administration and federal authorities claim the Tsamaev brothers acted alone and received no foreign help of any kind to carry out the bombings. The government must think American citizens are naïve to believe that a person identified as being complicit with radical Islam in Russia carried out a successful bombing act as a “lone wolf”. And to make matters worse, the administration is failing to treat the younger Tsamaev brother as an enemy combatant. After all, if the government and administration admit the Tsamaev brothers had foreign help then they would be seen as dropping the ball on national security. Sure, federal and local authorities thwart far more terrorist attacks than what happen. But keep in mind that many attempted attacks are uncovered in their later stages because of vigilant citizens – not because authorities were in the know. Also, this is the digital era where there are cameras in the hands of every citizen, on every street corner, and in every home and business. It is hard to hide anything from the law without big brother watching especially with the Patriot Act. One of the biggest errors made by the White House and authorities with regards to terrorism in the U.S. is political correctness. Officials are so afraid of offending Muslim Americans they fail to treat terrorists as enemy combatants, but they treat them as ordinary citizens. This creates a few problems. First, offenders are free from facing such consequences as the death penalty, life in Guantanamo, or enhanced interrogation techniques. Hence, the penalty does not equal the crime. Secondly, this methodology makes it extremely more difficult to obtain intelligence from captured terrorists who are allowed to lawyer up. Thirdly, it denies the fact these people are terrorists, but instead treats them as everyday common criminals. Officials are also afraid to profile Muslims, which could have prevented not only the Boston Bombings but the Fort Hood massacre. Because of these lax measures, for instance, no credible intelligence has been garnered from the “underwear bomber.” We know this because none of the people who trained the “underwear bomber” have ever been caught. The “underwear bomber” was trained to carry out a terroristic act which would have succeeded if not for his incompetence. The committees' Republicans conclude that Clinton approved security reductions at the consulate, pointing to evidence such as an April 2012 State Department cable bearing her signature. The cable was a formal request from then-U.S. Ambassador to Libya Gene Cretz for more security. In her testimony before Congress in January, Clinton said, "With specific security requests they didn't come to me. I had no knowledge of them." Clinton approved reductions in security levels prior to the Sept. 11, 2012, attack, contradicting Clinton’s testimony before the House Foreign Affairs Committee on Jan. 23. I was taking a small dose of medication for my thyroid prescribed by a doctor down here in Texas. When I moved to NH the medication ran out and nobody will give a prescription without seeing you. So I went to my annual physical with an internal medicine specialist ($) since the concern was about a thyroid growth. Well, I also had a small bump on my skin and the internal medicine specialist thought it looked like a cyst but I would need to see a dermatologist. She also recommended I have another ultrasound and see a thyroid specialist. So, I schedule the ultrasound at the local hospital ($$), then went to the thyroid specialist ($$$) to get the results. After about 10min with the Dr. he told me the ultrasound didn't show the growth and it was up to me if I wanted to continue taking the medication or not. From what I remember, this was about $300 for that conversation... and as you pointed out, that could have been communicated over the phone for free. Next was the dermatologist. He confirmed it was a cyst and asked if it hurt or anything. I said no, and he asked if I wanted it removed. Again, I said no, I was fine with it, just wanted to make sure it wasn't something serious. He told me to just let him know if I wanted it removed in the future. About a year later, it had grown some more so I called to make an appointment with the same dermatologist and told the receptionist or nurse that I wanted to come in to have a cyst removed and he had seen me before. Keep in mind I'm missing work for all of these appointments. So, my appointment day comes, I see the doc, and he takes a look and says, "well, I can't do that here, you need to see a surgeon for that but I can recommend one." Apparently, he can remove topical moles and such but not something under the skin. He also goes on to tell me it won't be covered by insurance because it is considered elective. As you can imaging, I wasn't too pleased with any of it and decided I could live with the cyst even longer. Finally, I get the bill for about $250. That kinda put me over the edge so I called billing and told them the story. Why would they schedule me again if they couldn't remove it in the first place? They finally cancelled the charge. It just seems to me we have lost common courtesy. It's all about the money and herding people through like cattle. I think the real problem is more about the lawsuits than the doctors themselves. If I try to look from their viewpoint, the internal medicine specialist doesn't want to say it is a cyst because it could be something else like cancer and then she gets sued. So to be safe, send the patient to a specialist. Same with the ultrasound and thyroid... no use taking a chance on that one. Need to order the test to CYA. What if a doctor did call or have a nurse call on their behalf to give a patient results? No real way to confirm the patient received the information... another lawsuit waiting to happen if something goes wrong. Transport that same childhood doctor and have him practicing today I would be willing to bet he would have sent you to a specialist. The general practitioner would be sued if you had died but it he sent you to a specialist and maybe you died before you could even get an appointment (which could easily happen under Obama care) or he couldn't figure it out and then you died, everyone did their job's. But even then, with the lawyers, someone and everyone would probably still get sued. I disagree with liberals on a lot of things, but no topic do I disagree more vehemently than on investment and spending. As a former business owner and author on the subject, it is a fact liberals think backwards when confronted with fiscal problems. Liberals use the words investment and spending interchangeably as if they mean the same things. Spending is defined as to pay out money. Investment is defined as a property or possession acquired for future financial return or benefit. Sometimes liberals refer to spending as a stimulus which they conclude is an investment in the economy. Some liberals such as Nancy Pelosi insist unemployment compensation and other anti-poverty spending is an investment in the economy. In fact, New York Senator Kirsten Gillibrand went on to say that 1 dollar spent on anti-poverty programs such as food stamps returns $1.71 to the economy! Really, a 71% return on anti-poverty investments! Maybe we too will get rich if we too invest in ant-poverty programs. This is in insane for several reasons. First, and most importantly, federal government spending simply distributes wealth from one person to another. The government collects taxes on wealthier citizens and redistributes these funds to poorer citizens. If anything, this act should be deficit neutral. But we know this is not true because the federal government is actually 16 trillion dollars in debt. Hence, if anti-poverty spending is an investment, where is the benefit or financial return? In previous posts I have pointed out that fewer than 30 cents on the dollar make it to people who are registered to collect anti-poverty funding. This is not an investment. Secondly, a big problem many liberals have with the wealthy is that they invest and save their money. Hence, liberals draw the misguided conclusion that this does nothing to help the economy because they are not purchasing good and services. When, in fact, this type of investment is best for the economy. Money saved in banks allows them to hand out loans. Investments in companies help them to expand and grow. And income earned through investments is taxed and provides the government with tax revenue. Quantitative easing programs initiated by the Federal Reserve (which is chartered to monitor the fiscal wellbeing of the economy), for example, buy investments to stimulate the economy. The Fed does not spend more money on anti-poverty programs to stimulate the economy. Thirdly, for some reason most liberals I talk with favor government spending over charity spending. In fact, some do not think charity spending is an investment, but on the other hand are convinced government spending is an investment. Actually, the only difference between the two is that charity spending is more efficient than government spending by at least 20%; charities let people choose which anti-poverty programs they want to spend their money on; and charities do not operate at a loss. Fourthly, if Gillibrand’s logic is correct than that would mean that 1 trillion dollars in state and federal spending on anti-poverty programs this past year should have generate an additional 710 billion dollars for the economy (nearly 5% of GDP). That is enough money for 45 million Americans (90% of those living in poverty) to live at the U.S. median income level and enough money to generate, at a minimum, 77 billion dollars for the government in tax revenue. Well, since the government is in debt and 50 million people live in poverty we can conclude anti-poverty spending is no investment. So why then do many Americans believe what the Democrats preach about spending as being true? First, essentially anyone benefiting from these programs will side with the Democratic definition of spending. Secondly, and most importantly, Americans are routinely manipulated to think this way not only by the government, but by corporations. For instance, when we shop at a grocery store our receipt and checkout clerk will remind us that we saved a particular sum of money by shopping at their store. I routinely hear people talk about how much they saved when they purchased a new product. No matter how you look at it, when you buy something you are spending money even if you got it on sale. This is especially true if you are buying necessities or nonessential items such as food, clothing, energy, or electronics. You spend money on these items, but they are not an investment (although you can make money off real estate). Liberals may have convinced many if we put 1 dollar in our right pocket, it will magically generate $1.71 in our left pocket. However, the reality and facts show stimulus spending is no investment since there is no future benefit. It may create or save some jobs, but at what cost – 1 million dollars per job? This is no benefit or financial return. I hear how medicine has gotten so good over the years and this is the reason to explain why life expectancies are on the rise. This may be true, but it is no thanks to doctors. I have completely lost respect for the medical profession, especially doctors. I find them useless egomaniacs that are grossly overpaid. The reason medicine has improved is because technology has improved, not because doctors have improved. Advancements in drugs, imaging, and medical equipment come from scientists and engineers, not doctors. These advancements, such as in laser technology, have made certain types of surgery easier and less evasive. Yes, it takes skill to be a surgeon, but that does not mean the surgeon is making the medical profession better. Most doctors are mathematically illiterate, and therefore do not have the intellect to make technological advancements in medicine. As a young child I got infectious boils. Our family doctor made routine house calls to check in on me. Since we did not have much money, the doctor arranged for me to be hospitalized so I could be studied easier. I was placed in solitude because he feared what I had was contagious. After two weeks and dozens of blood tests my doctor concluded my immune system was failing due to a gamma globulin deficiency. I was given gamma globulin shots weekly for several years and I never had an infectious boil again. I never realized at the time, or even dozens of years later until I looked it up, my doctor saved my life. This condition would have killed me. Gamma globulin deficiency is referred to the “silent killer” because the symptoms are vague, random, and hard to decipher. Specialists existed in these days, but not as they do today. Hence, my doctor faced this issue by himself and solved it. Today, you would never see this – a general practitioner solving a problem to save someone’s life. Instead, a general practitioner’s role is to refer people to specialists (and hopefully they choose the right specialist). My wife and I have spent over $75,000 (including what insurance covers) on medical bills over the past 4 years. I was diagnosed with a rare neurological condition which was explained to me in three unique but conflicting ways (in other words the neurologist had no clue what was going on nor did they care). None of the 8 doctors I saw over the course of my diagnosis are losing any sleep over the fact that I am in constant pain. My wife’s condition has yet to be identified after seeing dozens of specialists. And judging by the fact that none of them have followed up with her; I know they are not losing any sleep over the fact she is suffering from chronic pain. My father went to three different doctors for stomach pain and bloating over a two month period. He was prescribed Pepto-Bismol. A week later he was spitting up blood and the gastroenterologist saved his life by cauterizing the source of the bleeding. After nearly two weeks and dozens of tests by specialists he still was not diagnosed. After looking at his symptoms online (we had a hunch) I took his records and film to an oncologist at the University of Florida. After 5 minutes he accurately explained my father’s symptoms without ever seeing him. The doctor explained how my father had 8 tumors and the liver tumor was far too advanced to correct. He said he may live another 2 months – four weeks later he died. My mother died of ovarian cancer. She had to have her tests performed twice before she was diagnosed because the oncologist lost her initial records. ObamaCare is going to aid in the medical demise. My in-laws can no longer find specialists in their community who accept Medicare. They have to drive 3 hours one way to see a cardiologist who accepts Medicare. ObamaCare not only cuts Medicare, but it eliminates the doctor fix. In other words, doctors do not want to see Medicare patients because it does not pay enough. Another troubling aspect of the medical profession is the United States has to outsource to find doctors. Just as U.S. companies have to hire foreigners for math and engineering jobs, the U.S. has to hire foreigners to be our doctors. I am not saying that foreigners are bad doctors, but in my experience there has been a serious communication barrier with most. So why is it that the costs of technological gadgets go down over time, but it seems the cost of medical equipment is always on the rise. The fact is that the cost of medical equipment is going down however it is the cost for doctors, who do not care about you, is what is driving medical expenses up. I am thankful for my childhood doctor; I will never find another like him. I have probably been to over 50 different doctors since, and none come close. If I had to rely on my current doctors to resolve my childhood issue, I am sure I would be dead. My childhood doctor would not let money come between him doing his job; he was proactive and not reactive to solve problems; and he sincerely cared about me. He certainly would have never set up a follow up appointment and say “I have no idea what is wrong with you” and charge my family 100 dollars. This is common today, patients get nickeled and dimed for information that could be communicated over the phone for free. It is all about money and not our health with doctors. Thank goodness there are good engineers out there that are supplying doctors with the equipment necessary to solve medical mysteries. It does not matter how much wealth a person accumulates, it is never enough. It does not matter how much wealth a company, the government, or organizations collect, it is never enough. For this reason, the new taxes on the wealthy and those implemented to raise money for ObamaCare (Medical Devices, Health Savings Accounts, Investment Income, Medical Expense Deductions, and Medicare Payroll Increase) will never be enough. The federal debt stands at 16 trillion dollars and the true national debt when accounted for liabilities such as federal pensions and post retiree benefits (social security and Medicare) is 87 trillion dollars. This equates to a debt of around $275,000 for each person in the country. It does not matter if we tax the wealthy at a 100% rate, it will not make a dent in this debt. Yet, cutting government spending is a hard habit to break, because what people receive in entitlement benefits is never enough. The state and federal government actually collect enough revenue (nearly 1 trillion dollars) to pull all 50 million Americans living in poverty into the upper middle class. However, since less than 30 cents on the dollar makes an impact on poverty (government waste), the amount of money collected for anti-poverty programs is never enough. If all of this is not bad enough, gender and ethnicity play its part in this greed. Since women are perceived as being discriminated against and treated unjustly, now they want the government to fund their contraception and abortions (Their role model – Sandra Fluke – was nominated at the Time person of the year). Yes, women are paid less than men (nearly 20% less, but this does not include child support and alimony payments for divorced or separated women). Minorities are also paid less. Is this pay discrepancy due to discrimination – Yes, but most agree it is less than 5%. Most discrepancies in pay are due to working few hours and working less skilled and lower paying jobs. Women and minorities take fewer risks than white men and therefore, only account for about 35% of company ownership (this trend is changing). Still, women and minorities fail to realize that the United States is the best place to live in the world and they take many of their freedoms for granted. Women and minorities receive more in entitlement and charitable contributions than white males and women live considerably longer than men. Take for instance the investment in breast cancer. Breast cancer (less than 1% of all cases effect men) is the third most common form of cancer, yet it receives more than twice the amount of funding than any other form of cancer. Prostate cancer is the second most prevalent form of cancer and it is nearly as deadly as breast cancer, but receives less than half the funding that breast cancer receives. Ovarian cancer funding dwarfs testicular cancer funding. Is this fair? Yes, because women made it happen. If I did not think it was fair I could raise money for other male causes – these are the freedoms we have in this country. Is it fair that women in the military do not have to fight on the front lines? I do not have a problem with it. I do not think this is a conspiracy against men, but at the same time I do not expect women should think they are being discriminated against because I think they should be responsible and held accountable for their own choices about promiscuity. I was a poor white male, but I never felt I was discriminated against because wealthy females and minorities got better opportunities at college. Women and minorities garnered most of the scholarships and the few co-op positions that companies offered. I could not argue since my grades were not as good. However, I knew of no engineers working 20 to 30 hours a week while averaging 21 credit hours per semester as I was doing. I did not receive a single penny of assistance from my parents, but I received a PELL grant one year (after my freshman year my mother never got her taxes done in time for me to qualify for future grants). Was this fair? Yes, unfortunately that was my situation. In fact, I was so grateful I paid back my grant with interest. I would have never done this if I felt everyone else was being treated better than me. After all, I did not understand the individual struggles each woman and minority candidate who competed against me for compensation and jobs had to face. It was best for me to concentrate on my struggles and adversity and do what was necessary to overcome them and succeed. I realize that not everyone has the luxury to pay back grants, but people like Michelle and Barack should pay back any grants they received so another person can benefit. Instead, we all feel we were entitled at the time. Should wealthy people accept social security and Medicare benefits? No, but most do because they never seem to have enough money. It does not matter whether we are poor, middle class, or wealthy we never seem to have enough money. It does not matter if it is the government, a company, or organization, they never seem to have enough wealth. We all want more, but it is not realistic. What is the reason Hispanics vote so heavily for Democrats? I really cannot say for sure, but I do know that the family values preached by conservatives are not working. Hispanics not only increased their electorate by 15% over 2008, but they voted for Democrats by larger margins (the first time they exceeded 70%). The one thing Obama did was sign an executive order that provided amnesty to illegal immigrants who met certain provisions. Is this what excited Hispanics to vote in record numbers and break for Obama overwhelmingly? I was originally against amnesty of any kind. I was turned off by Hispanics protesting state immigration laws by burning the American Flag and reverting to violence. This said a good number of Hispanics did not really love the United States and certainly would not want to assimilate to American customs. I also thought granting amnesty without securing the Southern boarder would only encourage more Hispanics to enter illegally. However, my opinion has changed. After giving it more thought, even if the Democrats granted amnesty to all illegal immigrants, it would not be advantageous for them to accept it. Hence, this policy could backfire against Democrats. So what has changed? ObamaCare is one reason! Liberals wanting healthcare reform argued that illegal immigrants would use the emergency rooms at hospitals to receive treatment for free. Hospitals cannot ethically reject treating people who do not have insurance. If Hispanics are granted amnesty they now would be responsible to buy health insurance or pay a fine. This is not going to be cheap (ObamaCare is driving up costs) and will be a big expense to immigrants struggling to get by. Another financial implication Hispanics will have to consider is taxes. Even if their income is low and they do not earn enough to pay federal taxes, they will have to pay Medicare and Social Security taxes. It is a big debate as to whether or not illegal aliens collect entitlements and how much. Liberals argue that only legal residents can collect welfare by law. That is true; however a Census report indicates 71% of illegal immigrants (mostly Hispanics) are able to collect welfare on behalf of their U.S. born children. The report also showed some disturbing numbers for both legal and illegal immigrants - they are more likely to collect welfare than other Americans (36% to 23%); they are more likely to be in poverty (23% to 14%); they are more likely to be uninsured (29% to 14%); and they are more likely to be uneducated (29% to 7%). Consider this; new immigrants are also subjected to a 5 year ban on federal entitlements – but of course there are exceptions. So, if you are an illegal immigrant, why would you want to be granted amnesty and eventually become a legal citizen? They will face healthcare mandates; they will face higher taxes; and they will possibly face a 5 ban on federal entitlements. The Census report confirms legal and illegal immigrants are poorer, do not have insurance, are more likely to be dependent on welfare, and have no education. So what is the advantage of being a U.S. citizen? Economically, this could be a disaster for many illegal aliens. Finally, the U.S. would be forced to implement a national ID card to enforce amnesty and illegal immigration policy. This is not something many Hispanics favor based on their objection to Arizona and other state immigration laws requiring citizens to carry proof of citizenship. Currently, illegals can live without the prospect of being deported in many sanctuary states and cities. They can be paid under the table and not worry about taxes. They do not have to assimilate because U.S. companies and governments are already catering to this demographic (For instance, pick 1, for Espanol on all phone options). They do not have worry about healthcare. And in all likelihood, many illegals can collect entitlements now. Why then become a citizen? Immigration has been a fiscal nightmare for many European nations since immigrants are the dominate users of entitlements. This may be the long term result of amnesty in the U.S. as well. If this happens, Democrats will be forced to enact austerity measures. The Census report indicated that 95% of legal and illegal immigrant households had at least one member earning some income. From this we can infer Hispanics want to work and will need good paying jobs, and maybe at this point in time, they will start to side with conservative economic principals. One complaint about Walmart is employees must endure weird and non-consistent hours. As a test engineer for Texas Instruments my hours were not consistent or normal. Since test equipment is expensive, the company expected engineers to use the equipment 24/7. Complicating hours even more was the fact many of our customers and manufacturing facilities were overseas making “weird” times for meetings. Many jobs have “weird” hours that are not conducive for a family unit. Yes, engineers are paid well, but keep in mind most engineers work a minimum of 50 hours per week and the average is probably closer to 60. Another complaint is Walmart products are mostly produced in China and the people who make them work in sweatshops. Assuming this is true, employees should then be grateful they work at Walmart in U.S. And let’s not forget that unrealistic union demands are the reason why manufacturing jobs are moving overseas. Walmart has been called racist because 70% of its employees are women – meaning women are being subject to lower paying jobs. This makes little sense. Using this same logic we can say the federal government is racist because over 60% of all people receiving welfare benefits are minorities. Liberals want the EPA to investigate Walmart for storing pesticides and herbicides in parking lots. They argue that this is a danger to food and water due to potential runoff when it rains. If this is a crime, then the manufacturers and the customers using these products are also guilty and need to be investigated by the EPA. Another complaint about Walmart is the documented high crime rates in their parking lots. But crime rates are higher in parking lots across the country, especially at malls. Parking lots are harder to patrol, harder to light, and they have easier escape routes compared to inside places. My car was broken into twice and hit 3 times in my company parking lot. If Walmart is evil then why is their pay and benefits comparable to other retail outlets such as Target? The free market determines salaries and benefits and as long as there is demand for workers to earn 10 to 12 dollars per hour companies will continue to offer these jobs. And let’s not forget, employees have choices in the United States – they can pick a job they like and have the opportunity to get an education to qualify them for higher paying jobs. But let’s face facts, many Americans are lazy and choose the easiest route. For instance, it is certainly much easier to earn a useless liberal arts degree than an engineering degree. Another argument liberals make against Walmart is their employees cost the taxpayers over 2 billion dollars annually in entitlements. Let’s point out most Walmart employees requesting entitlements are new employees who have yet to earn healthcare benefits and part time workers by choice. But at the same time is it okay for union and government workers to earn unrealistic pensions that are approaching 20 trillion dollars in unfunded liabilities (taxpayers are funding)? Is it okay for union workers to cost private sector companies billions in revenue (and the government tax revenue) because they go on strike? Is it fair that government workers are paid more than private sector workers for doing the same job? Still, Walmart pays far more in taxes and gives more to charity than their employees claim in federal subsidies. Consider this; a union line worker for an automotive company has an 80% chance to accumulate more wealth over their lifetime than a non-union PhD. engineer who designs the safety systems for cars. Remember, an automotive line worker can start accumulating wealth at 18. On the other hand, a PhD graduate cannot start accumulating wealth until they are 26 and by that time they are more than likely over 100K in debt with school loans. In this scenario, I assume the average engineer works at least 50 hours a week. Hence, a union worker who puts in 50 hours per week will be paid time and half for 10 hours per week. This scenario also considers that the union worker will have considerably lower healthcare costs. Is this scenario fair? Does this promote education over dropping out of high school? Does this promote ingenuity? And for this reason, U.S. automotive companies have become less competitive losing market share to foreign companies. In the U.S., Honda can make a comparable car to any GM, Ford, or Chrysler car for at least 20% less cost. The point is unions have to realistic about worker benefits, pay, and compensation. If unions were being realistic than Boeing would not have been forced to move some of its operations from pro union to right to work states and Hostess would not have been forced out of business because of unrealistic demands. The bottom line is that Walmart does far more for Americans than the federal government and unions combined. Liberals hail big labor unions and the government as the savior to the poor and Walmart as the evil corporation keeping people in poverty. Let’s examine the reality of this flawed hypothesis. Walmart made 15.7 billion dollars in profit last year (about $7100 per employee). Meanwhile, the federal government is over 16 trillion dollars in debt (about 51 thousand per person). Last year the federal debt was equivalent to 4,000 dollars per person. And this does not include billions in state debt or unfunded liabilities. Remember, the more revenue and profit Walmart collects, the more they pay in taxes, and the more capital and equity they have to expand and hire new employees. Does it make sense to pay higher benefits to Walmart employees, but employ fewer people? Walmart paid 7.1 billion in taxes last year (about $3,300 per employee). On the other hand, union member dues are tax free and therefore, unions only have to pay taxes on their investments and what they pay employees. Union leaders live lavish lifestyles like corporate CEOs. Many large unions own billions in assets such as owning Lear Jet. Yet, the taxes they pay are far less than 500 dollars per member. In fact, all so called non-profits in the U.S. accounted for 1.7 trillion in revenues last year (about 12% of our national GDP and 3 times the size of Walmart) and pay little in taxes. Walmart paid nearly 1 billion dollars in charitable contributions in 2011 (nearly $450 dollars per employee). Information is not readily available on union charitable contributions (for good reason, I do not think they give to charities). Walmart paid about $3.50 per person on lobbying and campaign contributions this year (Romney and Obama nearly split evenly). Most large unions pay anywhere from $50 to $300 dollars per member on lobbying and campaign contributions (favors Democrats by over 20 to 1 margin). State and federal governments will fund nearly 1 trillion dollars into anti-poverty programs in 2013 (6% of GDP). There are 50 million people living in poverty meaning this is equivalent to paying each person living in poverty $20,000 annually. The poverty rate for a family of 3 is just under 19,000 dollars hence a family of 3 living solely on welfare should receive nearly $60,000 annually – more than the U.S. annual income of $51,000. Therefore, there is ample tax revenue for state and local governments to wipe out poverty. However, since 50 million people still live in poverty we can assume the most a family of 3 living solely on welfare may collect is about 18,000 dollars annually. Therefore, at best, only 30% of government anti-poverty spending makes it to the people who need it. Think about it; if the government employed 100,000 people to administer theses hundreds of anti-poverty programs, and if we assume government overhead is 50%, then these employees would collect $350,000 annually. But we know employees are not earning $350,000 annually, this simply illustrates how inefficient and wasteful the government is. So the question is where does all this money go? This is similar to education conundrum. Each class in a public school receives about $250,000 annually, but less than 40 percent goes to teachers. Where does the remaining 60% go? Administrators, special curriculum, workers, overhead, and upgrades certainly cannot account for 60% of education costs? This is criminal. Walmart pays the average associate employee about $24,000 annually which includes salary, store discounts, bonuses, profit sharing, 401K contributions, and healthcare premiums. This is more than a family of 3 would receive from anti-poverty programs. I have long believed what determines a person’s character is how they deal with adversity. Every person faces many adverse situations during their lives. The first step in dealing with adversity is acceptance or accountability. Unfortunately, most people live in denial and avoidance when facing adverse situations. Developing a strong character usually stems from good family values. However, in the face of technology, single parent families, daycare, and other factors, family values are not being reinforced. Hence, present day personal character is narcissistic and centered around irresponsible traits such as finding blame and fault and our President is the biggest proponent of using these unethical tactics. There are three types of adverse situations: those which our beyond our control; those that are self-inflicted; and those that are needlessly created. An example of an adverse situation out of our control is people affected by Hurricane Sandy. A personal example is that I was diagnosed with a rare neurological disorder. Once I accepted the fact that life was going to be different I was able to move forward by adjusting my goals. This sounds simple, but it is not. The easiest way for me to find acceptance was to realize as bad as my situation may be, there are many more people who have worst disorders or face more adverse situations. I could feel sorry for myself and use this disorder as crutch to go on social security disability. This is not acceptable behavior, but it is a behavior our government endorses. However, I only think the government should intervene to help people who face adverse situations that are out of their control – such as Hurricane Sandy victims. Unfortunately, when something bad happens, many people may feel sorry for themselves, go into denial and expect others to resolve their situation. A good example of a self-inflicted adverse situation is when a teenager gets pregnant. Once again the government feels compelled to intervene and reward the pregnant teenager with welfare or assistance to get an abortion. What does this teach the teenager? It teaches them nothing because they are bailed out from dealing with the adverse situation. Pre-retirement entitlements do not hold people accountable for facing adverse situations, especially self-inflicted ones. Should we reward people who cannot find work but dropped out of high school? This is a self-inflicted condition. By rewarding this behavior, we are promoting a weak character where it is acceptable to hold other people accountable to bail out someone else’s ignorance or incompetence. If there are not consequences for teenage pregnancy, dropping out of school, or any other self-inflicted action, then how will this self-destructive behavior get corrected in the future? It won’t! All of this talk about the war on women and the war on minorities in our country just makes me sick. These are examples of needlessly created adverse situations. We live in the greatest country in the world and instead of accepting the fact that most of us are fortunate (even people that are less fortunate have the freedom to change that situation in the U.S.), we create adverse situations. We create unnecessary division and polarity. Would blacks prefer to live in Africa, would women or gays prefer to live in a Muslim dominated society, or would Hispanics prefer to live in Mexico or Latin America? Most of these areas are depressed; these regions are filled with bigotry; and most of these regions are not democracies and therefore civil liberties or due process laws are nonexistent. In America, if all things all equal, women and minorities would receive a job or get accepted into an educational institution over a white male. That is not a bad deal and it does not exist anywhere else in the world except in democracies. It is a travesty that we really think there is a war on women because health insurance does not cover contraception, Planned Parenthood is no longer funded, or abortion is not taxpayer funded. Since when is the onus of being responsible and accountable lie with our neighbors and the government. Equality does not mean rewarding for irresponsible behavior. If women can find this unrealistic fantasyland then they should live there. I’ve accepted the fact that Americans want to have it all, but they do not want to earn it. They want it given to them – healthcare, education, housing, food, unemployment, disability, contraception, and abortion privileges at someone else’s expense. In America, there are now more takers than givers and eventually the system will break and the bill will have to be paid. This will be a rude awaking and we will finally see how people deal with adversity when their entitlements are cut. At this point, people will be outraged and probably protest instead of realizing how unrealistic the role of government was in dealing with adverse situations. Republicans are mad with Mitt Romney for saying the truth – that Americans want “free” stuff and as long as Democrats keep delivering freebies to people who create self-inflicted or made up adverse situations then they will continue to beat Republicans. Pennsylvania Governor, Tim Corbett, has filed a lawsuit against the NCAA to drop the sanctions they placed against Penn State University due to the egregious acts of former football coach Jerry Sandusky. Many are upset and angered by these actions from the governor and for many good reasons - it keeps this story in the headlines and prevents the university and victims from moving on and starting the healing process; or the fact that Corbett supported the sanctions last year as they were handed down; or this will cost the citizens of the state millions in litigation fees. All of this is true, but anytime a person, organization, company, or government not only abuses its powers, but expands them, then someone has to stand up against these actions. It is the principle behind the precedent the NCAA has established that is the point behind the Corbett lawsuit. Corbett is not seeking any damages but just to overturn the decisions made by the NCAA to punish Penn State. As a Penn State alumnus nobody would like this horrible story to be removed from the news headlines. But, if Penn State suffers more media scrutiny and embarrassment (even though they are not part of the lawsuit), it is justified to correct the NCAA’s power grab. I hope Sandusky and university officials complicit in the cover up get what they deserve from the criminal justice system. I am not defending these monsters. But nothing these people did has any bearing on punishing the Penn State football program, the entire university, or the community for the appalling actions of a select few. This makes no sense. The NCAA levies penalties against programs that cheat and violate their bylaws. Each year thousands of student athletes and coaches are arrested and many for violent crimes. However, the NCAA leaves discipline in these matters to the school and the judicial system. Why does the NCAA turn a blind eye to these violations but at the same time decide to condemn Penn State? Simple, the NCAA made a “one time rule or exception” to their powers to punish Penn State. Sandusky abusing children did not help the football program to gain any advantage over its opponents, nor did it do anything to help the small businesses that rely on a full stadium for their survival. In fact, the Sandusky scandal did nothing to garner any advantage for the university. If Penn State is complicit in this scandal then why is local law enforcement who failed to prosecute Sandusky in 1998 not complicit (they held a grand jury investigation). Why aren’t the guidance counselors at the high school who failed to report complaints from students not complicit in this cover up? What about the justice system which hands down lenient sentences to pedophiles, are they complicit to this scandal? Of course, but for some reason Penn State is the only scape goat in these horrific crimes. There are many reasons and plenty of blame to go around for child abuse in this country, but Penn State is not one of them. For the same reason it makes no sense to punish an entire company for the acts of a few top tier managers (lowering its stock price affects thousands of innocent people), it makes little sense to punish Penn State as a whole and the community that relies on precious football revenues. Remember, universities rely on football revenues for not only sports, but academics. And for all those people that think Penn State covered up this act to protect its football program are misguided. Penn State is the only Division I program to NEVER be sanctioned in ANY sport by the NCAA for cheating. Penn State University has put academics in front of athletics more than any institution in this country. Just as with any cover up, the people doing the cover up are protecting themselves, their livelihoods, their egos, and their jobs. Cover ups are narcissistic in nature. Protecting the university and the football program are secondary measures in minds of people committing this cover up. My point is that the NCAA does not have the authority to place sanctions against any university for any criminal activity that does not advance or give the university or program an unfair advantage over other institutions. The NCAA cannot make up power grab rules and guidelines as they see fit. In fact, no governing body should garner this type of power. It is not fair or just and Corbett is right to fight this or any power grab by a governing body. Maybe this is more disgrace for Penn State, but we should not forget what happened to these children and at the same time we need to make sure the culprits are punished to the fullest extent of the law and not those innocent bystanders. 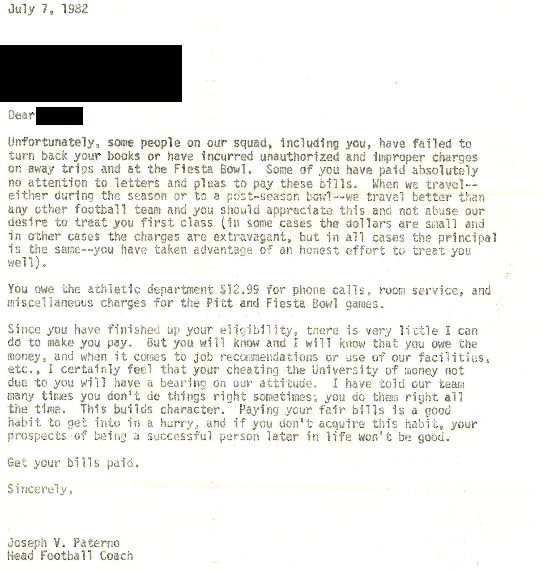 In this correspondence to a former player dated July 7, 1982, Paterno admonishes the player for not paying $12.99 in expenses incurred during Penn State road trips to Pitt and the 1982 Fiesta Bowl during the 1981 season. That '81 team finished 10-2, ranked No. 3 in AP, losing only to Miami and Alabama. The outstanding charges -- according to Joe -- are for “phone calls, room service and miscellaneous charges.” No matter what you think of Paterno's legacy in light of the last couple of years, this letter obtained by CBSSports.com is a slice of Americana and Joe Paterno. Joe Paterno was a man of principal. Let’s look at this from another perspective. The player that released this correspondence should be ashamed of himself. If he is unwilling to pay a 13 dollar bill, then what does this say about this person’s character? Does it say they are responsible and accountable for their actions? Does it say if they are unwilling to pay a 13 dollar bill then maybe they will try to finagle their way out of other more expensive bills? Maybe they will turn into a deadbeat who needs to be supported by fellow taxpayers. To say Paterno was out of line or even imply he is cheap is outright wrong. Paterno gave his first 40 years of salary (out of 66 years) back to the university (over 5 million dollars). When Paterno was fired he was the second lowest paid head coach in the Big 10. He turned down the opportunity to coach the New England Patriots and become the first million dollar coach back in the 80s. Yes, Paterno may have been a man of principal and hold people accountable for their actions, but this does not make him cheap. This is the problem with our society today – we demonize the guy who is trying to hold people accountable for their actions. The Freeh report portrayed Paterno as a man who put football and winning above the law. Paterno never had a NCAA violation against him for cheating in over 66 years. This is the same man who kicked their only long snapper off the team one season and replaced him with the undersized team manager. Paterno was a man of principal and that came before winning. To make matters worse, all this demonizing of Paterno has come since he died and is no longer able to defend his name and reputation. I find this convenient.